Last year, at Saint Leo the Great Catholic Church in Inwood WV, a Service of Advent Lessons and Carols was presented by combined adult choirs and combined children's choirs. Here is the program presented. 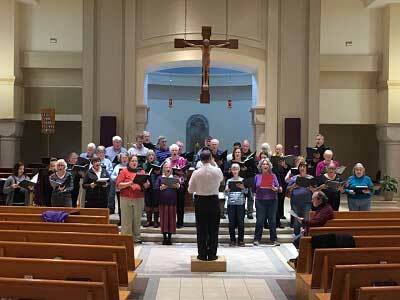 Welcome to this concert of Chorus Catholicus, a combined Vicariate Choir made up of Catholic choirs from the Eastern Panhandle (of West Virginia). This year we are joined by Youth Choirs from the parishes, as well as handbell ringers and instrumentalists. Clergy from our parishes serve as readers for the Lessons and Orisons (prayers). The translation used for the Lessons is the Douay-Rheims Bible (translated from the Latin Vulgate). The Orisons come from the Book of Divine Worship, the Missal used by the Roman Catholic Anglican Ordinariate. We hope you enjoy the concert this afternoon, based on the traditional service of Nine Lessons and Carols from Kings College, Cambridge UK. Lesson: Baruch 5:1-9 – Arise, Jerusalem!